Moisture Concealer is an advanced concealer, with skincare benefits, that covers discolorations, dark circles, and primes your eyelids, all in one easy palette. Gentle moisturizing botanical ingredients take care of areas prone to dryness, such as under the eyes, where concealers are usually most needed. The smooth, soft texture applies evenly, allowing sheer layering that applies perfectly onto skin with long-wearing results. Koh Gen Do uses cutting edge technology to create products for achieving high-definition looks, making it a cinch to apply base makeup like a pro. Gentle moisturizing botanical ingredients take care of areas prone to dryness, such as under the eyes, where concealers are usually most needed. The smooth, soft texture applies evenly, allowing sheer layering that fits perfectly onto your skin with long wearing results. Moisture Concealer also includes pearl powders for great coverage. The pearl powders and pure mineral pigments camouflage blemishes, freckles and general discolorations of the skin and deflect the redness that lighting can intensify. For all skin types, it will leave your skin looking natural without cakiness while giving increased coverage. Not only is this concealer formulated with skincare benefits, but it is also made without: Parabens, Synthetic Fragrances, Synthetic Dyes, Phthalates, GMOs, Petrolium-based Mineral Oil, or Triclosan. Light: Use as a base on the eyelids to even and brighten. Apply around the nasolabial fold to diffuse the line. New Moisture Concealer with a Perfect Texture for Application and a Gentle Formulation for Your Skin A new advanced skin care integrated concealer that covers discolorations, dark circles and primes your eyelids, all in one palette! The use of cutting edge technology to create products that achieve high definition looks makes it easy to apply base makeup like a pro. Flat, skin adhering-shaped powder for that long lasting wear. Prism-shaped with the newest color coating technology used to add more iridescence to the red, yellow and white pearly powders that gives a natural dewy luster on the skin. Round, oil-absorbing shape with indentations to keep that perfect fit. Round shape with moisturizing amino acid to prevent dryness. My experience: Moisture Concealer is a lovely moisturizing concealer that offers many color correcting possibilities to conceal dark circles, spots, and unsightly blemishes. The three shades can also be custom blended to create the perfect color match with a natural slightly dewy finish. It does have the obvious limitation that it will only work for pale and medium complexions- a true pity since this formula is so lovely and would appeal to a great many more people. As a person who often gets dark circles, I first apply the dark shade to that area (either with a concealer brush or with my finger) and blend it in. 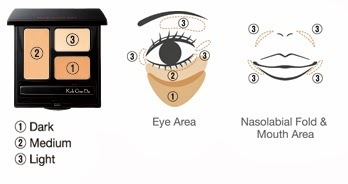 If I am particularly tired I do often have to apply a second layer and blend it until the dark circles are neutralized. The concealer is very creamy and spreads very easily without any tugging or pulling, and it offers buildable coverage. Afterward I mix the three colors and apply it to the remainder of my under eye area until I achieve just the right color so as to look natural. I find that the Moisture Concealer does not crease, fade, or settle into fine lines on me, but your mileage may vary. Many concealers dry out my under eye area, and then they look unnatural with a terrible flaky finish. but this is not at all the case with Moisture Concealer thanks to the Shea Butter, Jojoba Seed Oil, Perilla Ocymoides Seed Oil and Olive Squalane. Koh Gen Do suggests that their Moisture Concealer can also be used as an eye shadow primer, but I have not tried it in this capacity to determine whether or not I like it as a primer, but I do love it as a concealer! All ingredients: Caprylic/Capric Triglyceride, Polyglyceryl-2 Triisostearate, Propylene Glycol Dicaprylate, Synthetic Wax, Hydrogenated Polyisobutene, Phytosteryl/Isostearyl/Cetyl/Stearyl/Behenyl Dimer Dilinoleate, Glyceryl Behenate/Eicosadioate, Phytosteryl/Octyldodecyl Lauroyl Glutamate, Polyglyceryl-6 Polyricinoleate, Tocopherol, Squalane, Butyrospermum Parkii (Shea Butter) Oil, Simmondsia Chinensis (Jojoba) Seed Oil, Perilla Ocymoides Seed Oil, Palmitoyl Proline, Butylene Glycol, Silk Powder, Water, Glycerin, Sodium Palmitoyl Sarcosinate, Magnesium Palmitoyl Glutamate, Chamomilla Recutita (Matricaria) Extract, Palmitic Acid, Punica Granatum Fruit Extract Punica Granatum Extract, Ascorbyl Palmitate. Citrus Unshiu Peel Extract, Carthamus Tinctorius (Safflower) Flower Extract, Royal Jelly Extract, Rosa Canina Fruit Extract, Titanium Dioxide, Mica, Methyl Methacrylate Crosspolymer, Silica, Iron Oxides, Iron Oxides, Ultramarines, Barium Sulfate, Talc, Tin Oxide, Aluminum Hydroxide. Overall assessment: An excellent concealer, indeed! This concealer is well with your consideration if the colors will work for you. $54.00 from Sephora, Barneys and Koh Gen Do (Affiliate links). Stock photo from Koh Gen Do. I was wondering if you can suggest an antique gold eyeshadow for the fall, Helen. I am about NC20 if that serves as reference. This is definitely worth looking into. It definitely doesn't cake, crack, or look terrible or artificial. I like it, and think that it is very high quality. It's definitely worth going and swatching to see if you like the consistency. It's definitely nice having some color customizing options, but as I said-- it's limited to those with light-medium toned skin-- which really is a shame. I wish that they had one for darker complexions as well. I did see that post and it was amazing! I own and love a couple of your favorites. I was thinking about something perhaps less green (which I love love love for the Greek goddess look. Abyssinian catbird being my favorite) and a little bit more fall-ish (can I even say that?) perhaps with more black? I am not sure how to describe it actually. I need some fall in my life. NYC is starting to get cooler and I am so ready to embrace it. I want a different makeup look this fall: a bit melancholic, hazy yet warm. Do I make sense? Perhaps not :( I need a change in my life and makeup always help me along with a new haircut. Thanks Helen! Will do. I have a Sephora quite close to me and I am dying for this "physical" change to manifest along with some serenity! I just love how much you know about makeup. Hmmm...interesting and impressive indeed! This seems like a great product to try out based on your review. Love the shade and I see that it blends well with the skin. Its really a worth a try. I'll check on this.